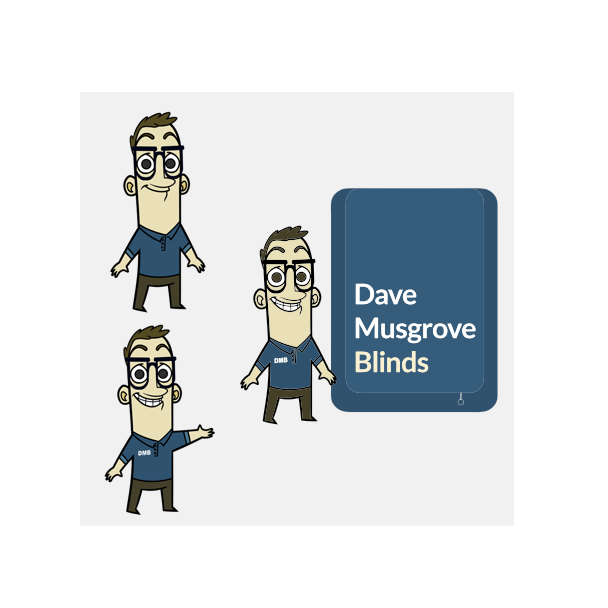 Dave Musgrove Blinds approached us with very little online presence, no brand and a basic website. We created a new brand, website and more and continue work with them to this day to ensure their online presence is tip-top. As Dave Musgrove is a sole-trader, his customers deal with him directly whether it's in their initial contact, their home visits to choose style and colour options or the actual fitting of the blinds. We felt that Dave's brand should reflect his individual and personal approach. This is why we decided to use Dave himself as the core element of the brand. By creating the character, and basing the rest of the brand on the colour and style of the character, we achieved our brief of ensuring Dave Musgrove Blinds was represented as real, honest and most of all - personable. 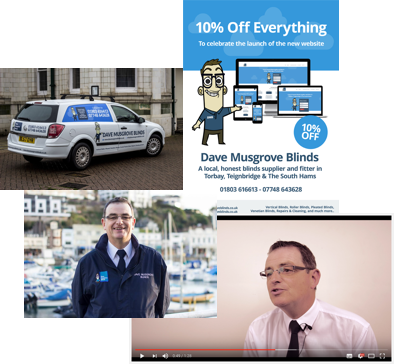 An early part of the process with Dave Musgrove Blinds was to create a strong online presence. Part of this was achieved by using Facebook, Twitter, Google+, Pinterest, Tumblr and more. 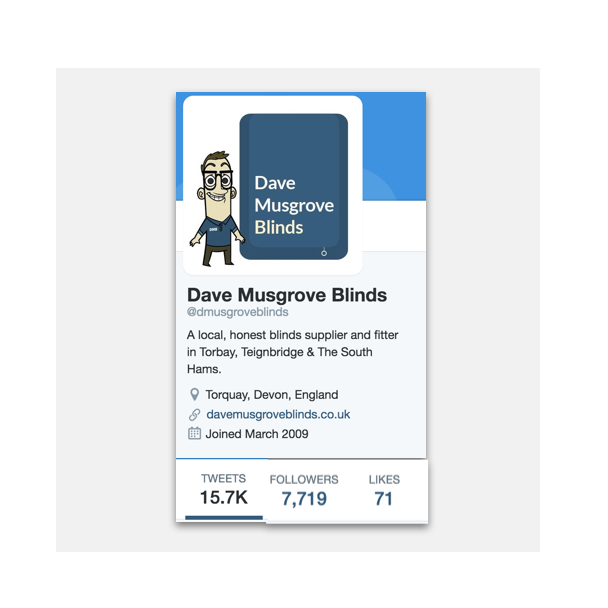 Using our unique, hand-crafted social media strategy, we got the ball rolling in the early days (February 2014) and are now super proud to say that Dave Musgrove Blinds currently has 7.5k+ followers on Twitter and achieves nearly 30% of his website traffic through his social media channels. Once the Dave Musgrove Blinds brand was created, it was time to implement it. We were lucky enough that Dave loved his brand and wanted to show it off here, there and everywhere. As part of Dave's ongoing marketing package with us, we implemented his brand in, among other places; the company vehicle, various flyers and leaflets, company stationary - business cards, letterheads, invoice templates etc, company work wear - shirts, ties, jackets, sweaters etc and even a short video which can be found here.